McDonald's fries could serve as a substitute for gold: They're that good, that beloved, and that color. Which is why it's so crazy that you'll be getting them for free this month. This deal is coming to you via Apple Pay, so don't just show up and demand free food. 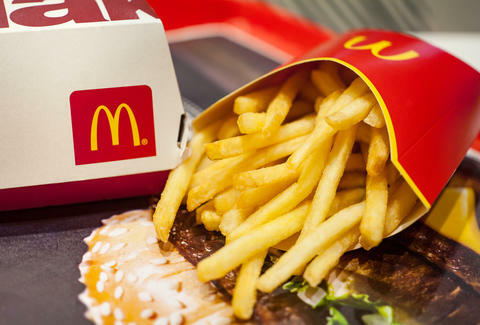 To get your free medium order of fries, you'll have to use Apple Pay to check out in the McDonald's iOS app. You'll also only be able to take advantage of this deal on Fridays (a pun, you see) in April. So your days to get golden potato staffs on the house are April 20 and April 27. Mark that on your calendar. You should also note that this deal is only available with a minimum $1 purchase, that you'll only be able to use it once per week, and that you'll have to use Mobile Order & Pay along with Apple Pay. Sure that's limiting, but being able to order McDonald's without having to actually be in a McDonald's is also kind of freeing. Also, complaining about free things is bad manners.